Last night Mariano Rajoy, the Popular Party candidate to the Spanish Government, imposed himself on his challenger, the socialist and outgoing Zapatero’s Minister of Interns, Alfredo Pérez Rubalcava during the unique TV debate scheduled in this electoral campaign. That was stated by a flash poll conducted by the agency Metroscopia immediately after the debate aired. In this head to head Rajoy gained the 46% of consents against Rubalcava’s 41%. The confrontation, aired in 19 Spanish unified networks, has been followed by more than 12 million people (27% of the share) with peaks of almost 14 millions during Rubalcava’s speech on unemployment, which affects about the 20% of the population. The polls’ defeat isn’t the only discouraging fact for the PSOE candidate. Regardless the recent victory over the terrorist threat of ETA (the gun-firing Basque independence movement), conquered by his own Minister, it looks like Rubalcava’s race to the premiership is the least fortunate in the history of the Spanish socialist party, due to the inheritance of Zapatero’s many wrong choices and decreasing popularity. The spread between the two parties (socialist’s PSOE and catholic’s PP) has grown to 16,7% in October’s poll. The prior record, dated back in the 2000 elections when PP’s Aznar won, was of 10,43%. That defeat meant the end of Almunia as socialists’ secretary and favored the rising star of Zapatero. 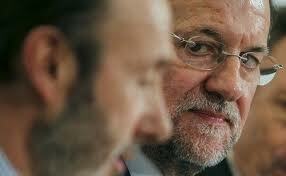 In conclusion, after two consecutive defeats in 2004 and 2008 elections, Rajoy risks seriously to win the race. His moment has come. A “now or never” situation that advantages him even though, to be honest, he seemed a little poor in contents during his interventions at the TV debate. Rajoy mostly attacked the current Zapatero’s government, letting the audience (and his core electorate – the Catholics) understand that, one of his first acts as a Prime Minister, would be the appeal to the Constitutional Tribunal against the possibility of marriage for gay couples (probably the only real progressive change made by Zapatero during his seven-year-long government).